Bike shop. Bar. Bike shop with a bar. It was only a matter of time before cycles and suds, two things that help define Western North Carolina, were combined into one glorious establishment. When Sam Salman opened Pisgah Tavern inside The Hub bike shop in Brevard three years ago, and started serving beer from the edge of the mechanic’s pit, bikers across the region let out a collective, grateful sigh. A custom-built iron arbor separates the tavern from the store. Rows of knobby-tired mountain bikes and racks of performance wear designed to wick sweat while making you look hard-core fill the store. In the tavern, jolly adventure guides sip pints next to dads in from Charlotte, giddy about their recent war wounds earned on nearby trails. On busy days, you’ll find 50 people in the small shop/pub, which sits on the border of Pisgah National Forest and some of the most storied mountain bike and road rides in North Carolina. Now, WNC is home to two giant balls of yarn. 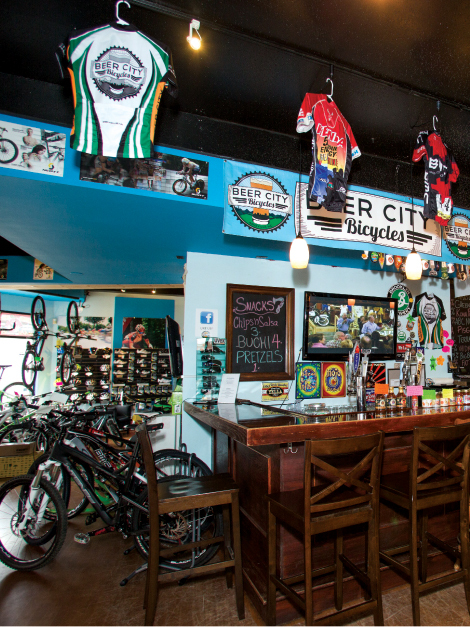 Last June, Beer City Bicycles opened, giving Ashevillains their own place to enjoy local brews while getting a tune-up. Beer City took over a former pub, so the bar dominates the store and shiny new bikes hang from the ceiling like décor. You’ll also find Lycra-clad cyclists raising their heart rates on the shop’s state-of-the-art Computrainers. “It’s like a high-tech spin class,” says manager Frank Mandaro. “Cyclists need a place where they can get in a quick mid-week ride, and maybe have a beer too.” Bikes and beer: the new peanut butter and jelly. At the Bar: You’ll find Oskar Blues, Brevard Brewing, and Highland on tap and a long-standing $2 PBR can special that’s popular among local guides. Look for a margarita machine this summer. On the Bike: For the quintessential Pisgah trail experience, set out from The Hub and combine Clawhammer with Black Mountain Trail. You’ll begin with plenty of gravel-road climbing, but finish with a three-mile, sweeping, technical downhill guaranteed to leave you smiling. Ask at the shop for directions. For roadies, one of the most brutal and scenic road climbs in the South begins at the shop. Follow U.S. 276 as it ascends for 15 miles from the Davidson River to the Blue Ridge Parkway, passing Sliding Rock, Looking Glass Falls, and the Cradle of Forestry on the way. At the Bar: The beer list changes weekly, but expect seasonals from Pisgah, Highland, Green Man, and Asheville Brewing companies. Also keep an eye out for Pint Night, when local brewers show up to pour and discuss. On the Bike: For a quick road ride, pick up Town Mountain Road as it climbs 1,000 feet in five miles to the Blue Ridge Parkway, offering broad views of downtown Asheville and the mountains to the west. If you’re looking to make up for an extra pint or three, keep heading north on the parkway for another 30 miles to reach Mount Mitchell.